GameStop (NASDAQ:GME) is quite an enigma. On one hand, you’d expect GameStop stock to ride the broader and decisively bullish trend in video gaming. On the other hand, GME is a brick-and-mortar store. As a result, it suffers the same competitive threat as other retail establishments. Unfortunately for stakeholders, the bears have won significantly more battles than they’ve lost. Over the last five years, the GME stock price dropped from over $40 a pop to its present, unsightly $10. Prior attempts to boost valuations have ended up as exercises in futility. Even when GameStop stock seemed to settle down into a range after the company failed to find a buyer, the bears didn’t hibernate for long. Last month, GME lost more than 10%. It goes without saying that the safe money is to avoid the company altogether. However, just prior to its fourth-quarter fiscal 2019 earnings report, GME stock popped up slightly more than 2%. Is this a sign that perhaps a recovery is on the way? Or is this simply a dead horse no longer worth beating? As with anything involving video games, the answer is extremely complicated. First, let’s take a look at the forecasted earnings print for GameStop stock. Approaching GameStop’s fourth quarter, investors have two clear options: take the obvious road, or go contrarian (perhaps against everyone else’s better judgment). The former choice is the one that anybody who lacks risk tolerance should elect. The consensus estimate for earnings per share (EPS) is $1.58, which is near the lower end of individual forecasts. These range from $1.47 to $1.73. Worse yet, we’re seeing a declining trend in expectations and actual performance during the final quarter of the fiscal year. For instance, in Q4 fiscal 2018, the gaming retailer generated $2.02 per share of GME stock. In Q4 2017, that figure was $2.38. Based on Zacks Equity Research’s proprietary algorithms, the firm has a pensive outlook on GameStop stock. I can’t blame them. The company seemingly had an opportunity for a buyer, but negotiations crumbled. More critically, digitalization continues to rear its ugly head. E-commerce giant and all-around disruptor Amazon (NASDAQ:AMZN) has its eyes on video-game streaming. So, too, does internet king Alphabet (NASDAQ:GOOG, NASDAQ:GOOGL) with its Stadia platform. Although I believe that these streaming options will ultimately have a limited impact toward console-makers like Sony (NYSE:SNE) and Microsoft (NASDAQ:MSFT), I’m not as confident that GameStock stock will avoid substantial damage. As failed brick-and-mortars like Blockbuster learned, streaming’s inherent conveniences hurt badly. I recently discussed GameStop’s long-term viability with some of my younger associates. They echoed the general distaste for GME with one word: why? Why stand around in line when you can download games quickly from your own home? Why tolerate poor customer service, and even poorer game buy-back rates? After enjoying the creature comforts of digitalization, GameStop seems pointless. So does that mean investors should not even pay attention here? Again, if you place a premium on not seeing red on your portfolio, the answer is a hearty yes. GameStop stock is not for the faint of heart, nor does it suit even many risk-tolerant folks. However, the company isn’t without its tailwinds. For one, a place will always exist for console-centric games. While streaming will capture casual gamers, the data transfer involved in streaming games with ultra-realistic graphics is extremely onerous. From a practicality standpoint, advanced consoles will always be a step ahead from streaming platforms. Plus, not everyone has access to high-speed internet. One of the nuances in the telecom-merger wars is that many rural areas — and some reasonably populated locales — lack adequate internet services. Essentially, these gamers have no choice but to shop at GameStop, thereby boosting GME stock. Finally, many of the concerns that my young associates raise are addressable ones. For instance, it’s relatively easy to weed out bad customer service. Also, GME can incentivize frequenting their stores with more attractive buy-back rates or rewards programs. But by no means is GameStop stock a sure thing. It’s always dangerous to go toe-to-toe with digital competitors, especially if you rely on physical growth engines. At the same time, it’s not entirely unreasonable that GME could spike on speculation. 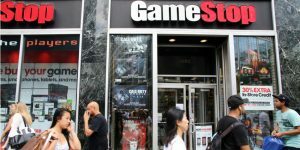 Article printed from InvestorPlace Media, https://investorplace.com/2019/04/avoid-gamestop-stock-everyone-but-gamblers/.